Create the most colourful, fantastical sundaes and cones with your very own Play-Doh ice cream cart! Top off your creations with dollops of realistic-looking whipped cream made from Play-Doh Plus compound! Contains cart, ice cream dish, 2 cones, spoon, scoop, roller, ice- cream bar book mould, 2 ice-cream bar sticks, extruder, 2 cans of Confetti Play-Doh Brand Modelling Compound and 1 can of Play-Doh Plus Compound…. This toy costs approximately £11.99 (for the latest and best prices make sure you check our retailer list for the Play Doh Ice Cream Sundae Cart above). 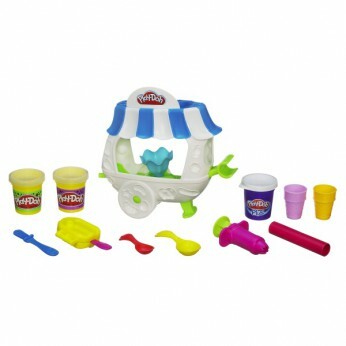 In our review of Play Doh Ice Cream Sundae Cart we classed it as being suitable for ages 1 to 3 years, 3 years, 4 years, 5 years but recommend you check the manufacturer specific advice before purchasing.